Student division: Round Robin tournament of 1980 games, where everybody played two games against everybody else. Only the individual student authors were eligible for the title. Mixed division: Elimination bracket of 16 best bots (including non-students and teams). The replays can be downloaded here. Terran 82 6 82 0.93 23: Student: University Maastricht LetaBot: A Terran bot with wall-in implementation. Based on Nova and UAlberta bot. LetaBot uses Liquipedia Build orders, text mined by Dennis Soemers. Extra build order tips from CardinalAllin partially added as well. Zerg 77 11 77 0.88 19: Mixed (non-competitive) https://github.com/chriscoxe/ZZZKBot: A simple throw-away proof-of-concept cheesy kamikaze 4-pool bot implemented in a short amount of time to reach low-hanging fruit. Effective against many bots that do not have a solid opening economy/defence. Zerg 75 13 75 0.85 21: Mixed (non-competitive) Savage zerg bot. Shows no mercy. Protoss 65 23 65 0.74 24: Mixed (non-competitive) XIMP bot. Carrier push. Terran 60 28 60 0.68 23: Mixed (non-competitive) ICEbot 2.1 from Intelligent Computer Entertainment Lab., Ritsumeikan University. Potential flows, finite state machine, enemy strategy prediction which triggers adaptive strategy rules and a lot of other heuristic things are applied in this bot. Protoss 58 30 58 0.66 17: Mixed (non-competitive) Reactive protoss with carrier. Based on ualbertabot. Terran 56 32 56 0.64 2: Mixed (non-competitive) Silly and nasty. Zerg 54 34 54 0.61 14: Student: UNIST Implementing more strats . . .
Protoss 49 39 49 0.56 23: Mixed (non-competitive) Simple Protoss bot. Protoss 47 41 47 0.53 20: Student: Technical University of Denmark Simple WIP zealot rush-bot. Protoss 46 42 46 0.52 21: Student: Comenius University, Bratislava Simple toss bot utilizing potential fields, with building placement trained by a genetic algorithm. Zerg 46 42 46 0.52 15: Student: University of Liverpool https://github.com/s7jones/PeregrineBot - simple 5 pooling Zerg I made to learn BWAPI. Protoss 45 43 45 0.51 24: Mixed (non-competitive) AIUR v2.2. Please visit aiur-group.github.io/AIUR/ for further information. Protoss 44 44 44 0.5 12: Student: Universidade Federal de Minas Gerais A proof-of-concept bot to test strategy selection in StarCraft. Strategy is the incorporation of the behavior of another StarCraft bot. So far it can behave as Xelnaga, Skynet and NUSBot. Zerg 43 45 43 0.49 19: Student: Epita, Paris GarmBot is a Macro-heavy bot, expanding rapidly to try and overwhelm the enemy with an unstopable stream of zerg units. Now with some lurkers. Big update incoming to upgrade to BWAPI 4.1.2. Zerg 38 50 38 0.43 0: Mixed (non-competitive) Developed by team UPStarCraftAI, a group of senior computer science students at University of Portland. Our bot is a six pool zerg rush. Additional scouting is performed after defeating the enemy base in order to find hidden buildings. Protoss 36 52 36 0.41 7: Mixed (non-competitive) A protoss bot made as a school project. Terran 35 53 35 0.4 23: Mixed (non-competitive) Simple Terran bot based on agents, state machines and lots of ifs. Terran 29 59 29 0.33 20: Mixed (non-competitive) Bot by the name of Tyr. Battlecruisers... mech... bio? What is going on!? Protoss 26 62 26 0.3 15: Mixed (non-competitive) Disabled from scratch Zealot bot. Terran 24 64 24 0.27 6: Student: UQAM A Terran bot based on UAlbertaBot. The intent is to use some spatial reasoning for strategic decision making and to play defense until mid/late game. Protoss 24 64 24 0.27 8: Student: Technical University of Denmark Protoss bot with combined rush/tech strategy. Terran 23 65 23 0.26 0: Student: Rensselaer Polytechnic Institute First attempt at an AI. Rudimentary Terran bot that does a bio build. Random 22 66 22 0.25 12: Mixed (non-competitive) OpprimoBot is the first and currently only bot in SSCAIT to play with random race! It is constructed around a modular multi-agent system to make it flexible enough to handle all three races. Protoss 22 66 22 0.25 8: Student: Dickson College The best Starcraft bot I have ever made, so you know it must be good! Kappa. Still (not really) working on it. Terran 20 68 20 0.23 6: Student: Oslo and Akershus University College A very dumb bot made from scratch. Terran 19 69 19 0.22 0: Student: Rensselaer Polytechnic Institute Basic Hierarchical Finite State machine combined with flocking to create a siege tank bio timing push. Terran 15 73 15 0.17 6: Student: UNIST Cheers! 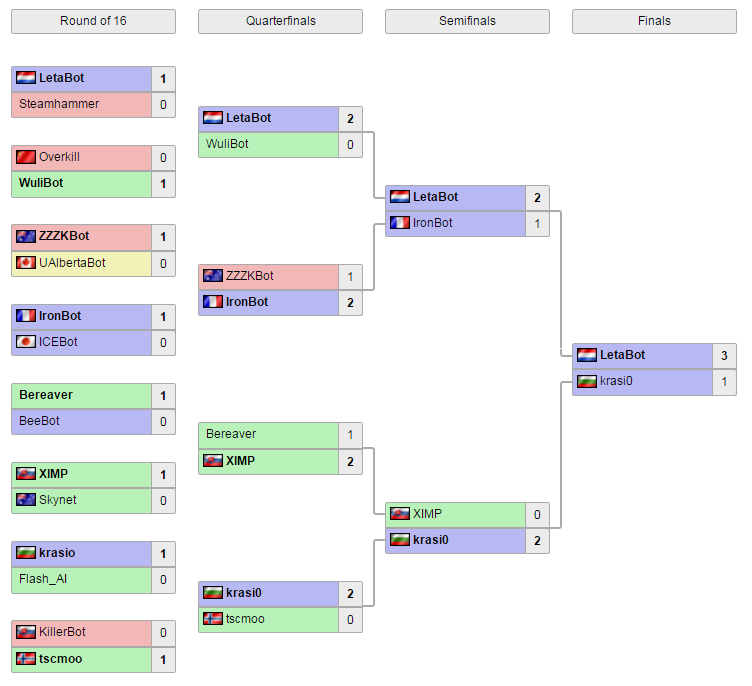 Protoss 12 76 12 0.14 12: Mixed (non-competitive) this is a tweaked bot of Adam Montgomerie moosebot all credit goes to him and ualberta still learning and testing with this. Maybe unstable! Still not undersanding! Any help is welcomed.